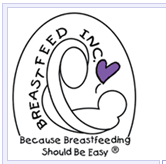 As important as learning to position the baby at the breast is to find the position(s) most comfortable while breastfeeding. A chair with arms and good support for the back is best. This will keep from having to lean over the baby while breastfeeding which can cause tension and pain in the neck and back. (Figure 1) Using a foot stool so the legs can be bent at the knees can make the mother more comfortable. Pillows or rolled up blankets can be used as support for the mother’s arms and under the baby to lift him to the breast. 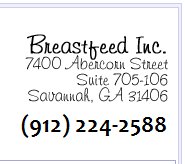 When breastfeeding in the sitting position, the baby’s head is held in the crook of the elbow with the arms and hand supporting baby’s back and bottom. This is the cradle hold. (Figure 2) The baby’s body is turned to face the mother’s body, tummy to tummy, with his mouth at the same height as the breast. Baby’s ear and shoulder should be in line with his hip and his head will tip back slightly. If baby’s lower arm seems to get in the way, it can be tucked under the mother’s arm around her side. Once baby is positioned correctly and securely and the mother is comfortable, she can begin to concentrate on getting the baby latched on to the breast.